Somaclonal and phenotypic variation caused by genetic and/or epigenetic modifications, are a valuable source of genetic variation to improve desirable polygenetic traits in crops. In this study, we induced somaclonal variation in vitro pineapple (Ananas comosus var. MD2) through hormonal induction, NaCl, and abscisic acid (ABA) supplementation. Our results showed that supplementation of high concentration of 6-benzylaminopurine (4.0 mg/L BAP) alone or combined with indole-butyric acid (IBA) produced the highest percentage of dwarf variants (100%). Murashige and Skoog (MS) media containing 4.0 mg/L BAP plus 2.0 mg/L IBA produced the shortest plantlets (1.9 ± 0.1 cm). In comparison, MS media containing 1.0% NaCl induced formation of dwarf plantlets with a mean plantlet height of 1.4 ± 0.3 cm, whereas 1.0 mg/L ABA generated plantlets with a mean plantlet height of 1.7 ± 0.1 cm. We then analyzed the histone deacetylase (HDAC) enzyme activity for dwarf and non-dwarf plantlets. In general, dwarf plantlets exhibited higher HDAC activity than non-dwarf plantlets. 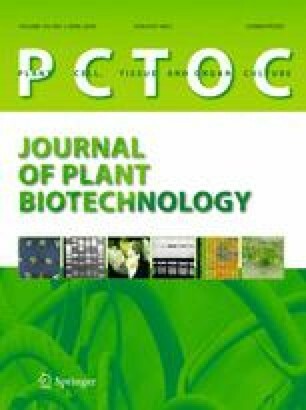 The highest HDAC activity (109, 333.33 ± 4.40 ng/min/mg) was recorded for dwarf plantlets grown on media supplemented with 1.0 mg/L ABA. The dwarf variants also underwent phenotypic recovery to normal phenotype within 8 months after transferred to MS basal media. No ploidy alteration was detected in these dwarf plantlets after analyzed by flow cytometry. Taken together, although the generated dwarf plantlets showed higher HDAC activity compared to non-dwarf plantlets, their capability of reverting to non-dwarf phenotype suggested that it might be due to epigenetic modulation. The authors thank the Ministry of Higher Education, Malaysia for the financial support (FRGS Grant No. FP041-2014A) and University of Malaya, Malaysia, for providing the experimental facilities and PPP grant PG117-2015A. JSY and NK conceived and designed the research. NAAH and MRM conducted the experiments. JSY, NK and MM contributed reagents and analytical tools. NAAH, BCT and JSY analyzed the data. NAAH, BCT and JSY wrote the manuscript. All authors read and approved the manuscript.